Hinnanud külastajad pärast oma peatumist majutusasutuses Wapi Resort. Kindlustage parim hind peatumiseks majutusasutuses Wapi Resort, mis on hiljuti külastanutelt saanud hindeks 9. The property is gorgeous!! All the pictures that have seen online don’t do justice.... You have to be THERE! Nothing pretentious but a beautiful mix of Thai flare and contemporary décor... The owners are very friendly and him and his staff very helpful.... The seafront view is one of the best on the island. The room are quite cute and bed so comfy (and sheets and towels are changed EVERYDAY!!!) I can only strongly recommend Wapi Resort... good value... great experience... I will be back! + as we took the morning ferry from Langkawi and arrived early at the resort, the owner, Yohan, was kind enough allowing us to check in to our bungalow. + the bungalow is clean and we were given 2 stainless steel bottle for us to refill water at their restaurant. There were also mosquito burning coil in our bungalow which we can burn it to rid the mosquitoes. + daily breakfast is good + there were also complimentary snorkelling masks and fin for guests use but we didn't use it as we brought our own. + we tried the massage within the premises with a small discount of 50baht on each massage and massage was good. + it is quiet and relax along sunrise beach + the only person that is friendly is the owner. And he was also kind enough to arrange his staff to bring us to the check in point for our return ferry to Langkawi. + we like that they have their weekly island cleaning on every Monday and encourage environment friendly to guests. Super good location, nice beach. We stayed second row beach house and from there was also seview. Lovely houses, wellcleaned. Right by the Sunrise Beach (the beach that gets the morning sun, so there's no walking distance after breakfast), fresh and beautiful rooms, with a lovely front porch, each equipped with a high pressured water hose used to wash off sand from your feet + an effective anti mosquito "candle spiral". The manager is super helpful, nice and professional. The beach villa was clean and comfortable. Breakfast was excellent.The sunbeds were comfy and the staff friendly. The food in the restaurant was very tasty and fresh. The sunrises on the beach were beautiful. There was a very good thai massage place on the premises. 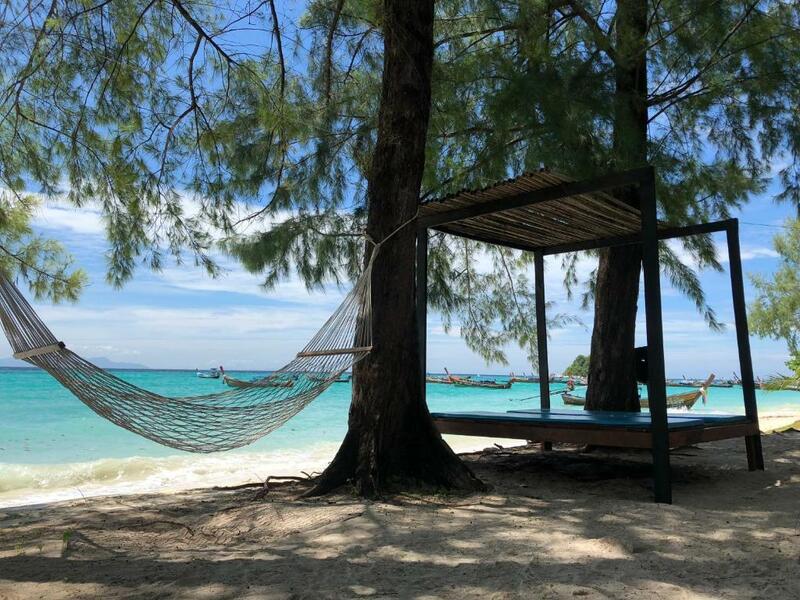 Wapi Resort is THE PLACE to stay on Lipe Island! There is NO other place like Wapi: perfect location, great staff, clean, environmental concerned, very good food, we walked all around the island, and the is NO other place like Wapi Resort. Thanks Johann! Amazing place with wonderful owner who sincerely takes care of you and happy to help and gives great advices! We loved the resort! Nice beach bungalows, close to everything. Restaurant is fine! Highly recommend. Wapi Resort is set in Ko Lipe, within less than 1 km of Lipe Floating Pontoon and a 12-minute walk of Military Camp. The accommodation offers water sports facilities, as well as free bikes and a garden. The tour desk can help arrange some activities and free WiFi is at guests' disposal. At the resort, the rooms include a terrace. The rooms come with a flat-screen TV, and certain rooms come with a sea view. At Wapi Resort the rooms are equipped with a seating area. Wapi Resort offers a children's playground. Cycling is among the activities that guests can enjoy near the resort. Majutusasutuse asukoht meeldib eriti paaridele — nad on andnud sellele hindeks 9,7. Wapi Resort on Booking.com-i külastajaid vastu võtnud alates 14. juuni 2018. Millal soovid peatuda majutusasutuses Wapi Resort? Eraldi sissepääsuga bangalos on konditsioneer. This bungalow has a sofa, tea/coffee maker and air conditioning. This bungalow has a tea/coffee maker, air conditioning and private entrance. This bungalow has air conditioning, tea/coffee maker and private entrance. Rõduga bangalos on istumisnurk ja veekeetja. Tähtis teada Wapi Resort võtab vastu erisoove – lisa need järgmisel sammul!